Google the search giant, smart watch maker? Could a Google watch take on the likes of Pebble? Google may be trying to bring back the wristwatch, or at least a tiny computer that looks like one. Though the question isn't whether or not the device is possible. Google already patented a smart watch complete with flip-up display last October. The harder question to answer is: will it sell? According to a Business Insider source, Google is in the process of trying to figure out just how to market such a device. Of course, the smart watch would do more than just tell time. Google could feed users GPS directions, product info and email notifications through the wrist computer. According the the patent, the flip-up display would be transparent to some degree, allowing the screen to overlay info onto the real world, augmented reality style. Though the smart watch may fulfill a few sci-fi fantasies, the fact that Google might be close to selling the wrist candy isn't far fetched. Project Glass is Google's other pet project in wearable computing. For the unfamiliar, it's a pair of smart glasses that also features a transparent screen to view the world through and get info. And it doesn't sound like the Google glasses are that far away. There has already been talk that Project Glass will release to the public in 2014, though the first wave of the device would go under the "Explorer Edition" brand. Developers, however, will get the chance to go hands on with Google Glass during two events - one scheduled for later this month and another at the beginning of February. Wearable computers may be the haute couture in years to come. Apple recently received a patent for a shoe equipped with sensors and a processor. 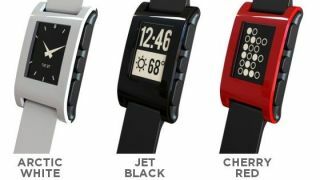 Well known smart watches made by Pebble started shipping a few days ago after a rousing Kickstarter campaign. If Google does break out a smart watch, it would be a perfect way for the company to push some of its hyper-local advertising. Perhaps the watch would tip wearers onto new coffee shops in their area, or offer discounts on items in the local grocery story? We may soon be living in a world where our clothes are smarter than we are.